I love pretending I’m Cleopatra visiting Caesar while ensconced in this vast Roman-themed resort. It’s still fabulous but not as posh and kitschy-fabulous as it used to be now that Harrah’s has bought it. The days of the fine china, circular beds, hot food in the Diamond Lounge and cash-in-the-mail bounce back comp checks are ovah! But it’s still fun. We spent a whirlwind three-day weekend here and loved every minute of it. Too tired to gamble so we watched CNN and gobbled up the complimentary cheese basket that the hotel put in our room, ordered hangar steak and chicken sandwiches, Caesar Salad, some Cleopatra Coffee (coffee laced with amaretto, whipped cream and cinnamon), cracked open a bottle of wine from the mini-bar and thought we’d get a second wind. We did not, so we called it a night. Woke up around 9am, took a jog down Las Vegas Blvd. to CVS to buy a curling iron since I’d forgotten to pack mine. Had a Croque Monsieur for breakfast at Payard Patisserie inside the hotel. Soaked in the Roman Baths and Artic Ice room at Qua Spa. Recessionista Tip: Roman Baths and Ice Room are free when you stay in one of the towers! Watched the Pussycat Doll dancers parade through the Casino to signal that the Pussycat Doll Lounge was open for gaming! Couldn’t resist, so we played some blackjack. Lost about $100 in under 10 minutes. Went to the Forum Shops where we blew more cash shopping but at least have some brand new clothes and kicks to show for it. Left Caesar’s to meet up with friends who live in Vegas for dinner and then went with them to see their buddy Grammy-winning buddy Joe Esposito (He co-wrote Donna Summer’s “Bad Girls”) perform at Piazza Lounge inside of of the Tuscany Hotel. Esposito’s two man band is tight. He plays great disco music, the dancefloor was jam-packed and we joined in the merriment. We danced until about 2am. Then we hit a roulette table. Two hours later walked away with about $200 in chips and remembered to sign up for Total Rewards cards so we can get free stuff when we gamble. 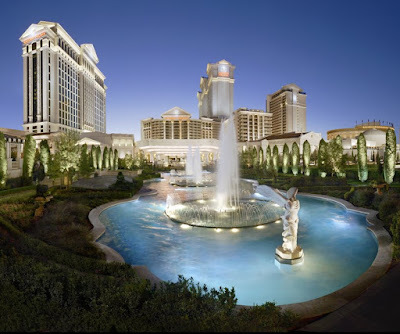 Recessionista Tip: Once you are a Total Rewards member call customer service before you book a trip to Vegas and find out what kind of deals they are offering based on how much you gamble. We had a nightcap at Cleopatra’s Barge and watched Paris Hilton and her boyfriend Benji Madden stroll by on their way to Pure Nightclub where Nicky Hilton’s birthday party was happening. We called it a night around 4am. Woke up at 11am and ate breakfast at Augustus Cafe. I recommend the “Caesar’s Breakfast”. Took a cab to the airport and hopped on the 2pm flight to Burbank.